Halfway up Broadway, where it crosses 51st Street/Pleasant Valley Avenue, there used to be the big Bilger quarry. The Oakland Paving Company mined a body of traprock (mapped as Franciscan quartz diorite, a near-basalt), crushed it, and shipped it out via a rail spur that crossed Broadway at 42nd Street and curved toward the former depot at 41st and Shafter streets (you can see the trace in Google Maps). This is what’s left. I’m standing at the very edge of the Catholic cemetery overlooking the Rockridge Shopping Center. Beyond it is a remnant of the original hill where California College of the Arts sits. It was a family estate before it became a school; perhaps they couldn’t stand the quarry operations and decided to give the place away. Still, the views from there are very nice, and the old quarry walls beautifully display the sandstone that adjoins the traprock as well as the faulted contact between them. Click the photo for a bigger version. The old pit holds water from the Rockridge Branch of Glen Echo Creek after it traverses the Claremont Country Club golf course. A glory hole at the other end carries the overflow into a culvert that runs down the west side of Broadway, daylighted in two small places (by the new Kaiser parking structure and along Brook Street) before it joins Glen Echo Creek proper just north of 30th Street. The photo below shows where the creek joins the pit. I think the little waterfall on the left must be drainage from the country club grounds. It’s still pretty, and both are seasonal hidden treasures. The creek is barely visible from the other sideyou have to stand by that little promontory at the front corner of the Longs store. This entry was posted on 10 March 2008 at 2:51 pm and is filed under Oakland streams and water, Old quarries. You can follow any responses to this entry through the RSS 2.0 feed. You can leave a response, or trackback from your own site. I pulled up your pic of that gloryhole, you know, that thing is kind of scary, they have one on a large pond near eastern kansas city, but they have a large domed grating over the top. I know the risk is small if a person is smart enough to stay away from them, but then, McDonalds has to warn people that the coffee is served hot. I never knew this. I just stumbled on this blog recently, and I have to say that I absolutely love it. Keep up the great work. That is so cool. Every time we go to that Long’s I wonder what that big hole was. thanks! i have always been fascinated by this old quarry when i go to long’s. do you know what the walkway in the middle of the water is for? is this very deep or not so much? do you know if the restaurant on the edge that has been closed for at least 4 years is closed because of building safety, eg some sort of erosion at the edge? just things i’ve wondered. Chris, I don’t know about the operations of the quarry’s lake, but last week EBMUD was doing some work. The lake is drawn down a few meters and workers were probing the wet soil in the Gilbert/Pleasant Valley intersection on the corner farthest from the quarry. I think the culvert is leaky. But maybe EBMUD can answer your questions. The restaurant was Emil Villa’s, and they just went out of business. I think their style of ribs went out of style, but surely others more knowledgeable than I know better. i thought the creek running thru the country club was a fork of Temescal creek, no? or is glen echo creek just an alternate name for it? I have always wondered if this quarry had a rail spur accessing it. The angular parking lot at the old diner at 42 and Broadway seems to be part of an old right of way that extends between this quarry and the old streetcar and rail complex in the vicinity of Yerba Buena, Adeline and San Pablo. Odd angular boxy speculative housing structures (cheap cement block apartments) now fill this curvilinear corridor. I just came across your website. It’s GREAT! fyi, the former owners of the present-day CCA campus once operated a coal mine over by Livermore: http://teslacoalmines.netfirms.com/Tesla.html Geology is everywhere! Something tells me they gave up the estate because the mine bankrupt them, although I’m sure having the quarry as a neighbor wasn’t so pleasant either. Have you read Robins History of Rockridge? It’s wonderful…. spent days tripping around looking at historical sites. you’re doing a neat thing here. i was actually olooking for information on the Estate that was converted for The Claremont Country Club (The golf Club down on Bway Terrace) Was is Horatio Livermore? Andrew: I’m doing some work/research in the shopping center for an engineering firm. I’m specifically looking for some historical or geological data for this quarry. This site seem to be a few of the hits Google came up with. You won’t happen to know of other resources that I can look into? We’re just trying to obtain as much info as possible on the old quarry. Trying to determine the extent of the site and history of the quarry, more specifically how much of the material that was quarried currently sits underneath the exiting shopping center (fill material). Thanks, I will start with EBMUD or city of Oakland. Omar, you may like to look in the Oakland History Room, upstairs in the main library on 14th. The card file is a good place to start, and Steve the librarian is amazing if he is still there. Is the glory hole visible? I would like to see that! Steve has moved to another Oakland library, but the current librarians are excellent and will help. You refer to “a rail spur that crossed Broadway at 42nd Street and curved toward the former depot at 41st and Shafter streets (you can see the trace in Google Maps).” I’m not at all convinced that the rail spur from the quarry had anything to do with the Sacramento and Northern lines or depot. From the traces it left on the lot lines in the Google maps, it seems to have cut straight across Shafter and continued on toward the Bay. The traces are pretty clear to a little west of Telegraph, disappear for a few blocks, reappear around West St., curve south at Linden St., and disappear near San Pablo and Adeline. I think there was once an AT&SF track on Adeline. Do you happen to know when the quarry and its rail spur were last in operation? I’d love to know if the rail spur actually crossed the S&N track(s) on Shafter while both were active. A little late here, I just found this site… In answer to Omar, the shopping center site was faily level to begin with, requiring no cut & fill to speak of. This writer, as a boy, “mined” guppies from small depressions, the entire area being rocky, with poor drainage. There was a major excavation at the Broadway corner of the property, solid rock mounds that required the use of dinamite, which then became the vault of the bank on the corner. Anyone ever managed to go fishing in the old quarry pond? Every time I pass by it I wonder what (if anything) lurks in its depths…and it looks like it’s pretty deep! Adam, the water has looked the same, dark and foreboding, since at least the late 40’s, the fence even at that time was topped with barbed wire, and us kids would have rather fished at the “Three Lakes” in the cemetary anyway. My great-grandfather use to work at Bilger Quarry. Infact his home was a boarding house for some of the workers. Is there a place where I can find names of men who worked there? He lived on 43rd and the men that lived in the home all were from Italy. I am doing some family history right now and want to get more information. A yet unidiified man that resided above that ol’e rock quarry was out searching for his kitty-cat, and somehow fell, 100 ft. down into the quarry lake. Rescue workers later recovered his body summerged under 30 ft.
I’m also curious about that rail connection to the quarry. The right of way that crosses Broadway at 42nd was acquired for a Key System route that was planned to run all the way to San Jose – but from all I can find no tracks were ever laid on the section from the Yerba Buena junction through to Arroyo (where a short section was in service up to Oakland Ave). But I have seen several references to a narrow gauge steam line serving the quarry, but have yet to see any trace of it on a map, or any old photos. Anybody have any clues? The 1877 map at Old Oakland (link above) shows the quarry but no right-of-way. The 1912 map shows a rail line passing the quarry and running between 41st and 42nd Streets to Linden Street, where it curves down to Yerba Buena Avenue and the mole. I think that there is doubt about what I asserted in the post. We know that rail lines ran past the quarry; we know that quarries may ship their products via rail; but those two things do not establish that the Bilger Quarry actually used rail to ship its goods. Photos would help. Andrew, photographic evidence does exist in the form of Google Maps. A long gone right of way is still visible in the existing properties and buildings: Look at the corner of Telegraph and 41st, and take a sweeping curve to beyond the corner of 42nd and Broadway. The Map views is easy to identify this line of buildings, and the satellite view confirms it. Of course this is not proof of an actual spur line, but it does show the right of way to the quarry. Jeff, The Key System route ran along 40th st. to Broadway, through a cut to Howe, then curved up to 41st and Piedmont Ave to the terminal that still stands on that corner, thence north on Piedmont Ave to Brandon, and on to Arroyo. I grew up in that neighborhood, and well remember placing pennies on the tracks at Brandon St to be flattened by the train many times, and consumed many donuts sold through the window at the north corner of the terminal on Piedmont Ave! I’d ride the E train to the City and could peer down at the bay waters through the tracks if I sat at the very front of the train. I’m glad to see this question about rail service to the quarry is still getting some air! You’ve probably noticed they recently painted over the mural on the Piedmont Ave terminal – very sad! I’ve found the property maps showing the right of way acquired by the Key system for the “San Jose Line,” proposed in 1900 and abandoned in 1910 (never built). Here’s a contemporary newspaper account with a diagram that clearly follows the trace of odd-shaped and disjointed vintage buildings that now fill that strip. The Key line that branched off at the bottom of the grade on Arroyo and terminated at Oakland Ave. on Latham used a portion of that right of way. What I haven’t been able to find are references to rail service to the quarry before that proposed San Jose line. I hypothesize that if there WAS a line that served the quarry, that right of way would have been one very sensible place to have put it, and perhaps the Key System used an existing roadbed for that portion of their alignment. I have found references to the proposal for the line along 41st being driven by the crowded conditions of the lines along 40th. Incidentally, I teach at a middle school in that neighborhood and have been taking kids on walking tours – inspired and informed by Andrew – and they are fascinated by the “ghost” right of way and the Bilger Quarry pit, and the open mystery of whether there might be a connection between the two. Jeff, I hadn’t been aware of a mural on the key terminal, as that apparently happened much later. I remember that terminal being in service, so no mural would have been permitted in that period. I have lots of memories of the area going back to WWll, long before the shopping center and Emil Villas. Even at that time, there was no physical evidence of a spur track on the Bilger property to my recollection. One very good source you may try is the main branch of the Oakland Public library, where you will find many photographs of Rockridge at the turn of the century. Jeff Allen, thank you for that link to the 1906 article about the proposed line to San Jose! … shows a rail line apparently running along Yerba Buena Ave., then between 41st and 42nd Streets, then past the general area of the quarry, then through Piedmont to the Glenview District. Where the line crosses Park Boulevard, either the rail line itself or the street along which it runs is marked “Key Route” on the map. The line appears to terminate at Sausal Creek in the Dimond District. It matches pretty well what the Chron article calls the “new line to San Jose”. I still haven’t figured out when (or if) this line was ever actually in Key Route service. It sounds possible that the Key System took over the western part of the right of way at some point after the Bilger Quarry was done with it. Some of the houses on 41st street between Telegraph and Webster seem to date from around 1920. I don’t know if they were built with an active rail line in their back yards (and the right-of-way later divided up and sold to its neighbors) or if it was the removal of the rail line that made those properties available for building on. Well, I finally read the 1906 Chron article and it seems to answer some of my questions. The article mentions that the Key System had been buying the land where the line was going to run. It doesn’t mention that there had been any rails there before, so it’s starting to sounds a bit doubtful that a line from the Bilger quarry followed that route. The 1877 map shows a quarry at the Bilger location but no rail lines anywhere nearby. Apparently the quarry was able to operate without rail transport for at least part of its life, perhaps for all of it. Maybe I could tell you how and when the Bilger Quarry connected to the Key System and beyond. Send me a query ! What I would like to know about the Bilger quarry is its situation now. Will it be emptied? Does it contain fish? Does it create problems for the neighborhood and especially in regards to mosquitoes? Will it stay vacant? Where does the water come from and is it used as an emergency reservoir – like for the fire dpt? Frank W. Bilger was born in Oregon in 1868, graduating from the UC Berkeley department of pharmacy in 1889. Bilger worked for the Oakland Paving Company and then the Blake & Bilger Company as secretary, treasurer and main owner of both. travel easily by train to parts of Oakland and beyond. Several years ago a local resident fell 100 feet into the Quarry trying to rescue a cat and died. I don’t have any idea as to the purpose of the foot bridge or the water’s depth. Calling up EBMUD may give you an answer ! The pit full of water is used to maintain the grass at the Claremont Country Club. Frederick Meyer, the Founder of the California College of Arts and Crafts, purchased the four-acre James Treadwell Estate in 1922 for $ 60,000 !! It was located at Broadway & College Avenue in Oakland. The Estate was near the old Bilger Quarry area as well as the Claremont Country Club. Students, faculty, alumni, and the Meyer family all pitched in to transform the dilapidated buildings and grounds into a college campus. Meyer, a skilled horticulturist, did the landscaping, and some of his work is still in evidence today. The Key System proposed San Jose right-of-way, started out from 42nd Street and Linden Street and snaked thru the neighborhoods crossing Broadway and the # 6 car line and onward toward Piedmont. When Bilger’s was sending out loads of rock by rail, I don’t believe that particular right-of-way shown on google was ever used. The history books also say that a 3-foot gauge steam railroad ran into downtown Oakland from the Quarry location. I kinda doubt it ! However, several years ago, oldtime well-known railroad historian Robert J. Hannah (particularly well versed in electrified railroad operations in the Oakland area), wrote a treatise entitled “Freight Service of the Key Route”. This treatise covered all of the East Bay in KEY’s territories ! 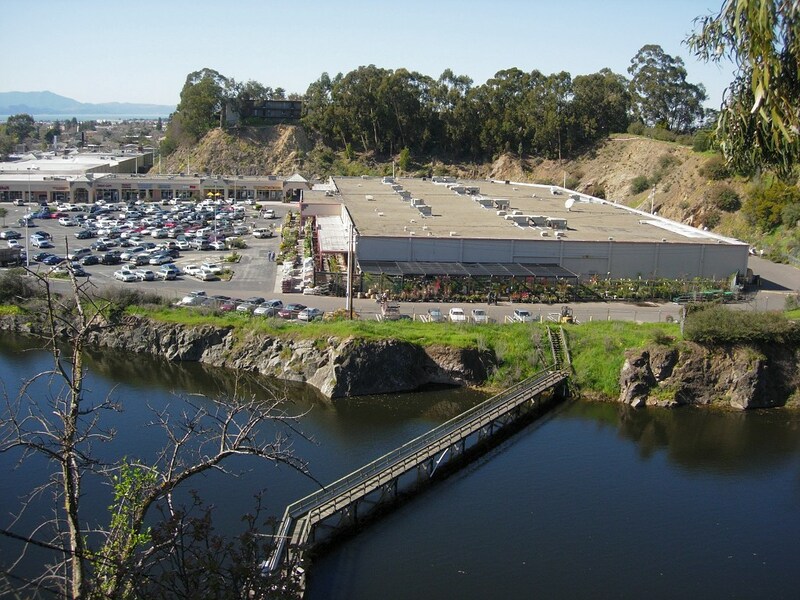 “Another long overlooked freight service was the trolley spur into the Rockridge Gravel Pit, (Bilger Quarry) now a fenced lake adjacent to the Rockridge Shopping Center across the street from “Claremont House”. When first built this was a spur through an open field but was later surrounded by 45th Street before going off on private right-of-way. The spur originated on the northbound track of the # 6 streetcar line on Broadway, and ended in a little yard where cars were loaded. To Bob’s knowledge the last use of this track was in 1934 when the train and streetcar tracks on Piedmont Avenue were rebuilt. At that time two trains of Differential Dump Cars consisting of two Motors and two Trailers (Cabs were placed on each end) made the trips. While there was a crossing just south of the connection with the Broadway trackage, the route required going against the cuurent of traffic to 40th Street where a single track connection from the north made a left turn into the C-Line ‘cut’.. (Towards Howe Street) Tracks to the Quarry were removed soon thereafter, but the electrified wire remained in place for many years ! There was a crossover between the tracks of the # 6 car line in the vicinity of 45th Street. And a single track that took off Northbound to “somewhere” before the # 6 car swung at a left angle off Broadway onto College Avenue. As trains, cars or whatever— exited Westbound from the C-Line ‘cut’ onto Broadway, there were block signals to guide work trains around the corner onto Broadway instead of directing themselves down 40th Street toward the SN Depot at Shafter Avenue. This is about all I can find at the moment. @JJ Lasne, the quarry pond is now owned by the country club which pumps out some for irrigating the golf course and probably has no plans to change. It’s an asset and would be expensive to fill in. I’m sure the Alameda County Mosquito Abatement District checks it regularly but it’s really too big and deep to support mosquito larvae (which need still water so they more typically breed in tiny puddles in tree holes, plant saucers, discarded bottles or tires etc.). Not usable by city fire trucks which need pressurized water for hoses. During the 1991 fire Calfire helicopters did dip out of Lake Temescal, which was a better source than the quarry pond– larger, more safely accessible and publicly owned. Thank you, Ken! I think you’ve established that a rail line actually served the quarry. It seemed obvious, but not everything that seems obvious really is. I have removed the duplicate comment that you posted, and I have edited out the part where you copied the text of this post, which wasn’t necessary. I have spent much time wandering around this particular body of water and have wanted to get a line in there for the last 15 years. Though it has been awhile I can tell you I have seen and heard some large splashing there. It would not surprise me to find that it does indeed support some mystery population of fish. When I was a boy on the East Coast we would fish in storm drains and forgotten farm ponds, places not unlike this. They would always yield big surprises! I remember what this area looked like before the Rockridge shopping center was first built. I was taking children’s art classes at CCAC in the 1950’s and during recess I’d go exploring around the small hills that were probably a result of rock and dirt from when the old quarry had been excavated with rock and dirt being piled up to one side. Kind of like landfill. I was always curious about that area and about the water so when I saw the two plaques in place at the newly revised shopping center I was pleased to know the history. Furthermore, my grandfather had worked with an Italian stone mason. I am part Italian, grew up in Oakland so this makes it even more interesting! Ah, so you may also remember that around this time of year, between those small hills of dirt/rock, were depressions where rain water collected. It was from those mosquito infested little pools of water, that I caught polliwogs in Mason jars. Raised in an aquarium at home, tiny frogs were found, all jumping around the kitchen floor one morning! I also attended summer art classes back then, but at the Oakland Auditorium. If you attended Piedmont Avenue School, do you remember Teds? Did you also do the Swim To Live program at Temescal Pool? You and I must share many more memories! Really interesting stuff. I too have always been fascinated with the “google maps” railroad right-of-way trace that leads away from the quarry site. Knowing that there was the (relatively) big yard at 40th/41st and Shafter, I always assumed that rock was carried from the quarry to there, and then from there to wherever. But, as someone points out above, the “google maps” trace doesn’t quite line up with the Shafter yard. The trace heads in that direction, but hits Shafter about a half-block north of the yard, and then appears to continue west, roughly between 41st and 42nd. The next really obvious appearance of that trace is at 41st and Linden, when the trace curves south to Adeline. The 1912 Teczno map shows that RoW. So did this quarry line just run parallel to the Sacramento Northern/Key System line a block over on 40th? Or am I missing something in that reasoning? I have been passing by Rockridge center for a while, and though I suspected there was water there, I only finally saw it this past week when I happened to go to AAA. I lived in the East Bay and used to shop at the old Safeway on Broadway 20+years, ago, but somehow do not recall ever seeing that water!! i love it. I am disappointed that it’s not public and there is no access. I want to know how deep it is, too. And what lurks in its deeps? !